tags: Pollution and paradise don't mix. Mario and Peach go on a vacation to Isle Delfino. But their trip soon gets spoiled after an imposter disguised as Mario paints and pollutes the entire island. Mario must clear his name, and clean up the entire island. Mario and Peach go on a vacation to Isle Delfino. But their trip soon gets spoiled after an imposter disguised as Mario paints and pollutes the entire island. Mario must clear his name, and clean up the entire island. Nowhere near as good as Luigi's Mansion, the game's puzzles are so repetitive and frustrating much of the game's fun is taken away. The camera angles are nearly impossible and Mario's moves are hard to learn. Spraying off graffiti, hanging on hooks that are nearly impossible to grab onto, balancing on tightropes, talking to Delfino residents and some of them punching you all the way across the town, a bunch of new, useless moves and even the music is pretty annoying after a while. Granted, the game is not entirely bad, it never gets boring just very, very frustrating. Maybe it's just me but I think Nintendo didn't put as much effort and thought into this game as they have with so many others. Overall rating: 4/10 I don't know why the "also known as" thing has "Super Mario 64 II" there because this was NOT a sequel to Mario 64 in any way and will never be worthy of being one. 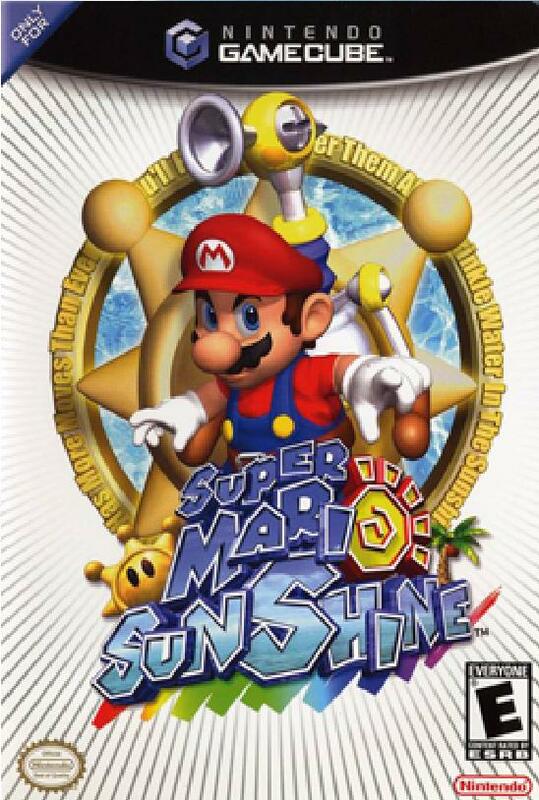 Mario Sunshine was just downright frustrating, it's not that it's too hard, it's just not fun. It's less fun, and more challenging, it's hard, like, stupid hard. Not like Mario Galaxy where everything was fun, and challenging at the same time, it only felt easy because I had such a great time playing it, but this? NO! I advise you to skip this Mario game like one of the comments said, first of all they added all of these dumb characters, like the Piantas which have like huge noses and then a tree growing out from their head (what's up with that???) and then they added almost NONE of the older Nintendo characters like Goombas, Koopas, they added all these new enemies. Then you have this guy named FLUDD who is your helper the entire game which is like this water backpack and he's so annoying. All of this new stuff is just crap man...this game is just a big disappointment, and doesn't deserve good ratings like some of the comments below me. Now not everything in the game is terrible, the music is cool, but not any memorable tunes, and then of course, in these platform levels, the Mario Theme will be playing which I thought was cool, the graphics are really nice, and SOME of the challenges in the game are fun, that's...in the beginning of course, the game just gets too repetitive, collecting EVERY single blue coin just to get all the Shine Sprites? PLEASE! Why can't it just be more simple like Super Mario 64? Oh and also being repetitive are all the levels, they're all the same kind of theme, island theme...you know, on a beach, on the sand, tropical setting, but I mean, even though it all takes place on an island, they could've added like...you know, a Cave level maybe? Some kind of rain forest or something? Or a level that's just all Underwater? I mean come on, not JUST some island theme levels. So yeah, this game is not good. If you want a Mario game, get a Wii and get Mario 64 on the virtual console, or get Super Mario Bros. 1, 2: The Lost Levels (THE Japanese VERSION, NOT THE US VERSION), 3, or Super Mario World, or Mario Kart 64, OR get Mario's newest one, Super Mario Galaxy! Just get anything BUT Super Mario Sunshine, and Super Mario Bros. 2, AKA Doki Doki Panic.